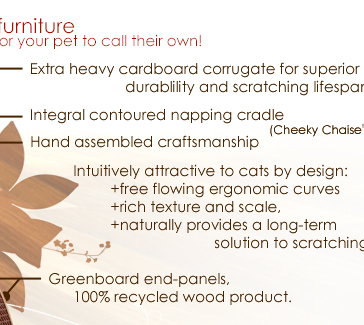 True modern furniture for your pet to call their own. 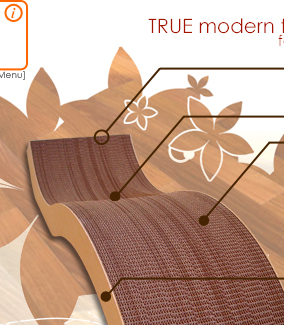 Extra heavy cardboard corrugate for superior durability and scratching lifespan. Integral contoured napping cradle, cheeky chaise. Hand assembled craftsmanship. Intuitively attractive to cats by design: free flowing ergonomic curves, rich texture and scale, naturally provides a long term solution to scratching. greenboard end-panels, 100% recycled.